Field Training VestTM (FTV18/36) is IRONWEAR'® is designed for obstacle courses and field training. Field Training VestTM was designed for police, fire department and military testing and training of personnel and has undergone over three years of intense field use. Designed originally by IRONWEAR's TM for the NYPD to test applicants and train cadets. 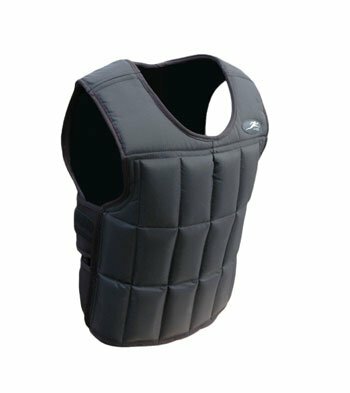 ( IRONWEAR's TM has been suppling weighted vests to the NYPD for over 10 years, the NYPD uses over 50 IRONWEAR TM a day to train and evaluate performance. Field Training VestTM is designed with a smooth front for crawling along the ground, climbing on walls and over obstacles. The padded ballistic nylon surface on the front of the vest is durable and slides easily over obstacles. All the edges are bound with soft fabric for comfort and double stitched for added strength. Field Training VestTM is fully adjustable with seperate chest and waist adjustments so that one size will fit a very wide range of sizes and body shapes very well. All the adjustment are in the back of the vest and second person is recommended to help secure the vest on the trainee. Once secured the Field Training VestTM will stay in position ready to move and twist with the course demands. Field Training VestTM incorporates all the latest patented IRONWEAR TM performance features: Ultra thin Contour-fitTM design, soft Flex-metalTM weights, Stretch-fitTMinner pockets and the Double-lockTM securing system which keeps the sides of the vests from moving during rigorous training. Field Training VestTM has 38 weight pockets which into which one or two ½ pound soft Flex-metalTM weights can be inserted. The shell itself weights just under two pounds. Field Training VestTM is a professional tool and should be used under professional supervision. If you have any questions about this product by Ironwear, contact us by completing and submitting the form below. If you are looking for a specif part number, please include it with your message.